"I focused on a big NESARA, as I usually do...over all the images and prayers, blessings and decrees...liberty bells ringing, people dancing and singing, the peace flag seated in every state, golden coins filling up the globe in every country city and home. It was toward the end of the focus that suddenly the black words of NESARA turned to GOLD!.." 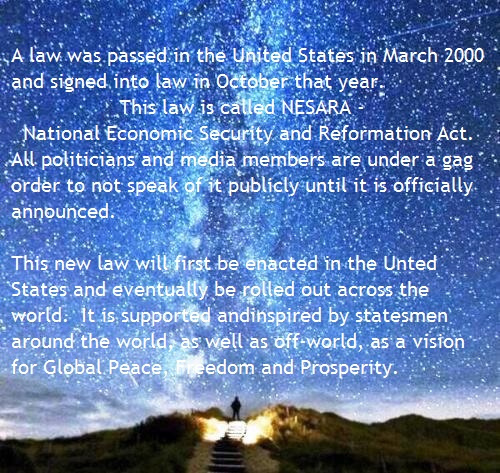 “I AM hereby calling forth Divine Government, and fully enacted NESARA Law, Now! “I Am anchoring the higher energies needed for this now! “All of us who are of the Light now work together as One. “We claim and call forth the Higher Good of humankind and all life on Earth, fully demonstrated in new and higher forms now! "A special thank you to all who are remembering to join the NESARA meditation on Sundays at 1:00 PM PST, or in 'no time' when you can. I felt the energies strongly from all of you. It is making a big impact. Keep it flowing until the announcements. HAPPY NESARA! Blessings, Stanley"
This is a clarion call for all who have learned Sananda's Hands of LoveLight Meditation - and everyone else in our Ashtar On The Road Family, as well as anyone beyond - who feels the calling, even if they have not learned this Meditation. They can use whatever spiritual tools and gifts they have AS ONE WITH US ALL!